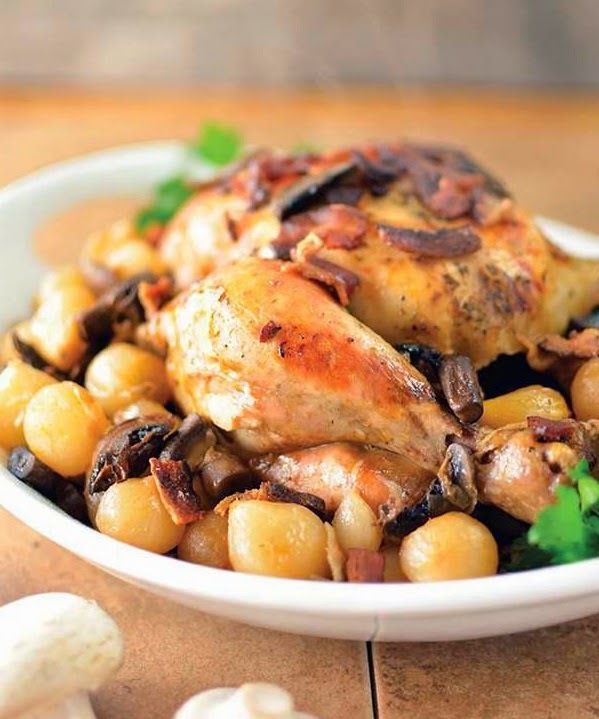 Coq au Vin is a traditional French dish that typically includes cut-up chicken, smoked meat, wine, and herbs. The chicken is braised to make it tender and delicious. I love taking the same flavors and throwing them into my slow cooker for a simple, no-fuss dinner that is tasty enough for company! Place the chicken in a slow cooker. Remember to remove any unmentionables from the cavity first. Sprinkle the chicken with the sea salt, pepper, thyme, and sage. Place the onions, mushrooms, garlic, and bacon on and around the chicken. In a small bowl, whisk together the red wine, chicken broth, and tomato paste. Pour the sauce over the chicken. Chunky chili con carne should be on you menu as well! !